Riley Masters learns this the hard way when she finds a wallet and decides to do the right thing. But returning it will cost her much more than she bargains for. Abandoned by her mother, raised by an indifferent father, Riley has accepted the fact that she would be alone always. She has no idea that a single act of kindness would propel her into a world where creatures that shouldn’t exist guard the human race from the demons that lurk in the shadows. That it will cost her the lives of those she loves while unearthing a destiny she never imagined with a man who is forbidden to love her. She finds passion, romance and the family she’d been searching for her entire life, but at what cost and what is she willing to sacrifice to find answers and happiness? 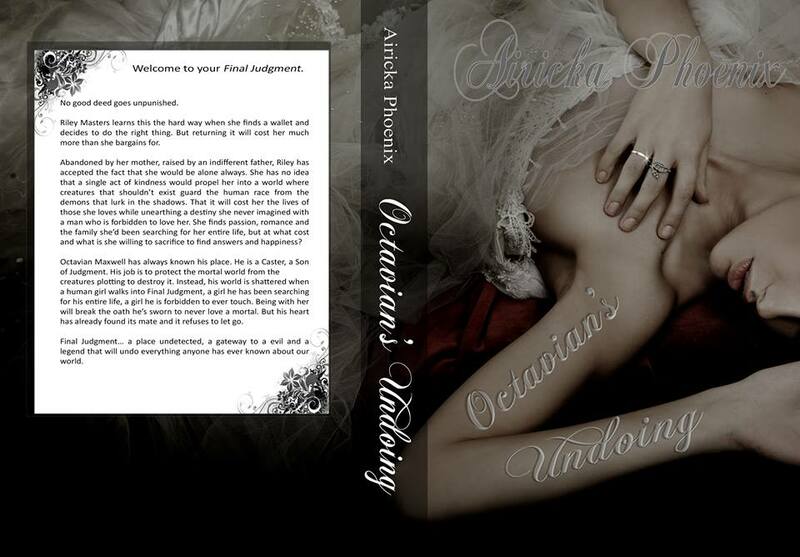 Octavian Maxwell has always known his place. He is a Caster, a Son of Judgment. His job is to protect the mortal world from the creatures plotting to destroy it. Instead, his world is shattered when a human girl walks into Final Judgment, a girl he has been searching for his entire life, a girl he is forbidden to ever touch. Being with her will break the oath he’s sworn to never love a mortal. But his heart has already found its mate and it refuses to let go. Final Judgment… a place undetected, a gateway to a evil and a legend that will undo everything anyone has ever known about our world. It was purely the hard surface at her back that kept her from sliding in a puddle at his feet. Her body thrummed. Her knees quivered. She was so hot it was a wonder she hadn’t exploded. Moistening her lips with a sweep of her tongue, Riley glided her fingers over his belt, tracing the strip of leather to the silver buckle in the center. She felt rather than heard his deep inhalation and the tremor that raked his powerful body. Driven by his surrender, she used two fingers to walk over the square carvings etched into his abdomen, biting her lip to stop the grin that pulled when he groaned. 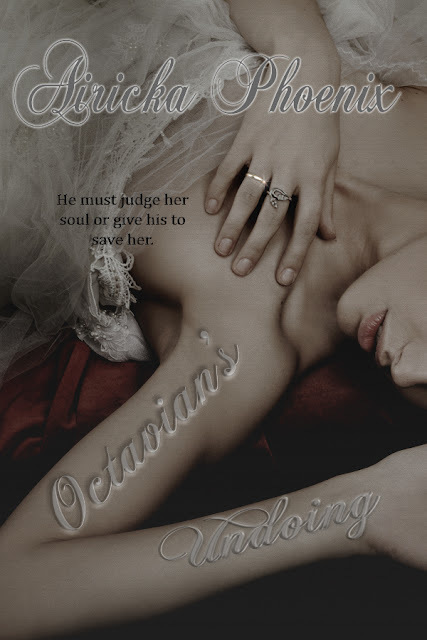 “I want to be both for you, Octavian,” she whispered, letting her lips brush the curve of his shoulder. 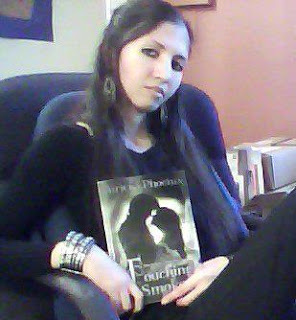 Airicka Phoenix is the best-selling author of The Touch Saga, The Dare Trilogy and Games of Fire with short stories in Whispered Beginnings: A Clever Fiction Anthology and Midnight Surrender Anthology. When she's not hammering away at the keyboard, she can be found banishing pirates or crawling through the attic looking for lost treasure with her kids. She loves baking, gardening and reading. She also likes to travel and take pictures of everything she comes across. When asked, Airicka describes herself as a sarcastic basket case that has an unhealthy addiction to chocolate, old movies and really bad jokes. She loves to laugh, make friends and write. If she could have one wish granted, it would be to spend one day as a fly-on-the-wall inside Stephen King's mind. If she could have two wishes granted, she would ask for a castle dedicated entirely to her overwhelming collection of books.